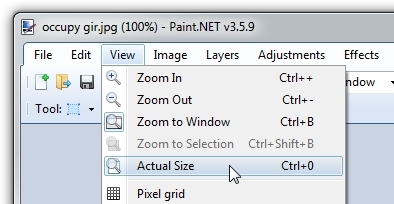 As it turns out, I forgot to deactivate Ctrl+0 as a shortcut key for “switch to image 10.” So, if you have 10 or more images open, Ctrl+0 will not work for View –> Actual Size. Thankfully, it does not perform both actions in this case, and you can still use Ctrl+Shift+A or Ctrl+Alt+0. I will be rolling out an update called, you guessed it, Paint.NET v3.5.10, to fix this. In the meantime, my recommendation is to install v3.5.9. However, if you’re planning on a deployment and would like to save some effort, I advise you to hold off until v3.5.10 is available. It should be next weekend (October 8th/9th) or the following (October 15th/16th). I may take the opportunity to fix another bug if any are found, or maybe to bundle in a performance improvement or two. For some reason, I didn’t even think of this until precisely 5 minutes after I had finished releasing v3.5.9. Why is it that things always seem to work out like that? It’s conscientious of you to fix the bug, but since an easy circumvention is available, I’d personally wait to issue another release until there is a more substantial reason to do so. I’d agree except for the fact that Ctrl+0 is now the primary shortcut key listed in the View menu. With 4.0 going to stop XP support, I’m just thrilled to see any releases for me. I just hope you’ll add a few more features for us XP holdouts before you say goodby (until I buy a new computer). While you’re at it, on my computer at least (Windows XP), Ctrl+Shift+A isn’t actually working in addition to Ctrl+0. Woops … you are correct. I’ve fixed this for the next update. Thanks.